While you sit happily munching away at breakfast, lunch, and dinner, day in and day out, an army of tiny, hard-working warriors are making sure your gut stays healthy. Your microflora – that is, the bacteria, fungi, viruses, and other microbes that comprise your busy internal ecosystem – perform this careful balancing act throughout your lifetime. Eating a healthy range of fermented foods can help you cheer on the right team – the good bacteria – in your gut. Put aside for a second the erroneous association of “fermented food” with spoiled, rotten, or bad food, and you’ll discover that you’re probably already eating foods that have been fermented. Not convinced? By supplementing and balancing the levels of good bacteria in our gut, eating fermented foods can help improve digestion, boost immunity, and may even help us stay lean.2 It has been shown that having a healthy gut also affects our psychological and emotional well-being.3 A healthy gut is one of the biggest cornerstones of a healthy life overall. DID YOU KNOW? Your gut produces more of the neurotransmitter serotonin, which helps regulate your mood, than your brain does. 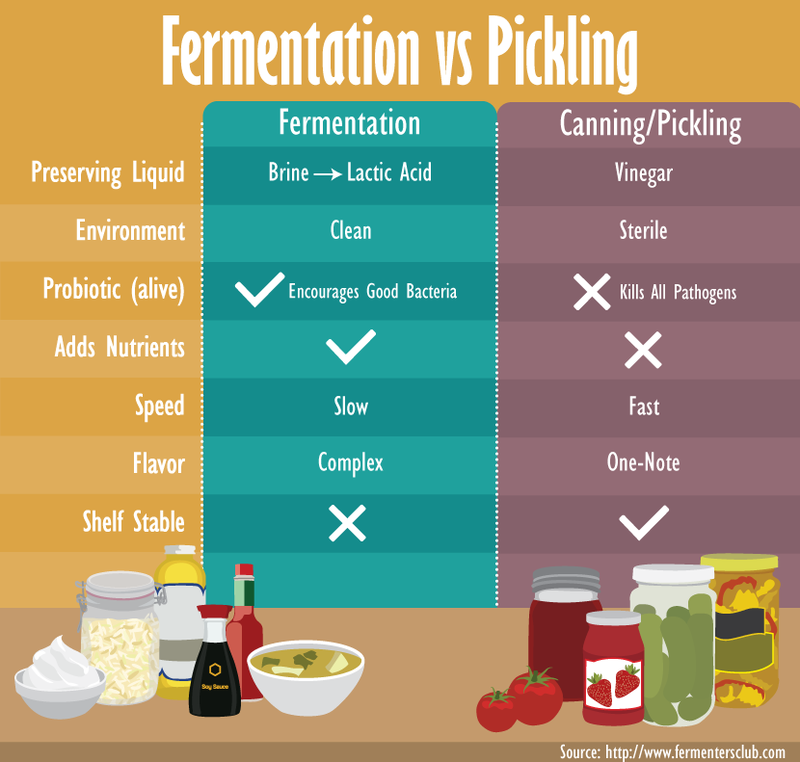 What’s the Difference Between Fermented and Pickled Foods? Before you go clean out the grocery store of all its jars of pickles in the name of health, there’s an important difference to be aware of between pickled and fermented foods. Because not all pickled foods go through a fermentation process, not all pickled foods offer the same health benefits of fermented foods. For example, jarred pickles that you find on a non-refrigerated shelf in the condiments aisle are often made using vinegar without going through the process of fermentation. This means that they don’t contain any of the probiotics that make fermented foods so beneficial for your gut. If you’ve never attempted home fermentation before, an easy vegetable to start with is white cabbage to make sauerkraut. Once you’ve mastered the basics of the exciting chemistry experiment that is home fermentation, you can start experimenting with all kinds of vegetables and even start creating your own yogurt and sour cream. Fermenting your food at home is the best way to maximize the foods’ probiotic cultures, which are often destroyed in large-scale, high-heat industrial processes that create common store-bought items like the ubiquitous jarred pickle. Make sure that your jars, weights, and cutting and mixing equipment are thoroughly cleaned before you begin. You don’t want to introduce any unwanted bacteria before you start! Dissolve 6 tbsp salt in 1 L of water on the stove. Add 1 L ice cubes to cool and transfer to a jar for storage. Choose a fresh, healthy-looking cabbage that is crisp, not floppy. Remove the thick outer leaves and trim off any excess hard stem. Dice the cabbage and rinse in your colander under cold running water. Pat cabbage dry with clean paper towel and weigh out 2 lbs. You’ll need about 2.5 tbsp salt for 2 lbs cabbage. Transfer cabbage and sea salt to the mixing bowl, layering the cabbage with the salt and mixing thoroughly for 2-3 minutes. It’s important to mix the cabbage and salt together well to prevent bad bacteria from developing where there’s a lack of salt. Fill your jars with the cabbage mixture and press down firmly to pack the cabbage down into the jars. 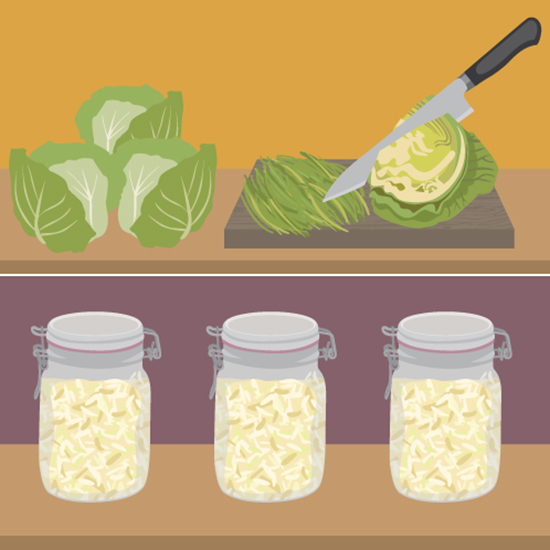 Fill the jars to about an inch and a half from the top, and then pour your brine over the cabbage to fully cover it, leaving about ¾ of an inch at the top for gases to escape (this is particularly important if you’re using Fido jars without an airlock). Place your fermentation weight, such as Pickle Pebbles, on top of the cabbage to prevent any pieces from floating to the top. Make sure that all the cabbage stays fully submerged in the brine. Seal the lids of your jars. To make the most of the healthy probiotics in fermented foods, you’ll want to leave your jars out (don’t refrigerate them) for 3-4 weeks at between 20 and 35?C (approx. 70-95F). Make sure to keep an eye on your fermentation lab as it progresses. While the appearance of a white film on top and some white sediment at the bottom can be fine, there are some warning signs to watch for that may indicate that your ferment has taken a wrong turn: mold, slime, creamy film, a yeasty odor, or pink or brown cabbage. These signs indicate that your cabbage is likely unsafe to eat. Back to the drawing board. Practice makes perfect! If things are on track, 3-4 weeks later, your cabbage is ready to eat. It will be packed with healthy probiotics for a balanced gut. For more information on the science of fermentation and detailed instructions on how to perfect your sauerkraut, check out Nourishing Treasures. Although home fermenting can seem overwhelming at first, practice makes perfect. Once you’ve mastered the basic process, you can start experimenting with a wide range of vegetables, and it is absolutely worth the effort. Ensuring that you’ve got a healthy gut will have a positive ripple effect for your overall health, right up to your psychological and emotional well-being.